The choices are explained further on this page. was far better, being a precise and clear demand. All the Mayor would have to do to fulfil that would be to get some Dutch engineers and tell them to get on with it (or send his people on one of David Hembrow's study tours to find out how). Similar blurring and watering-down of what members very clearly want by the small activist core of opponents of segregated infrastructure has happened before. Five or six years ago when LCC held a big consultation of members on what its "vision" for London should be (this was the Blair era when we had more "visions" than in the Old Testament), the overwhelming call went up: "Make London like Amsterdam or Copenhagen". Which the then leadership turned into the empty slogan "Working for a world-class cycling city". And a lot of good that did. I think, however, it should be obvious to readers which option I recommend members vote for, if we are not to have another 30 years of largely ineffective campaigning for cycling in London. The campaign the LCC carries out on this occasion may or may not have an effect on the policies of the next Mayor, but this vote should set the campaigning direction of the organisation for the future, and, as the largest cycling organisation in the UK that is primarily a campaigning one, the effect of LCC's new position will be felt nationally. What's wrong with the other three options? Well, 1 and 2 are just suggesting putting in place more of the "fantasy targets" beloved of UK cycling policy. The Mayor cannot get 100,000 children cycling, or double the number of local journeys made by bike, by magic. The Mayor can just agree these are desirable targets and then do nothing, forgetting them as all the other fantasy cycling targets get forgotten. They certainly cannot be achieved without doing Option 3 first. Option 4, the gyratories, properly gets absorbed into Option 3. High-standard infrastructure on a number of priority routes would imply solving the gyratory barriers for cyclists. But to call for the removal of the gyratories as an objective in itself is a mistake, and one that LCC has made before, about 7 years ago, when it had a big "Junctions Campaign" that achieved little. It achieved little because removal of such gyratories is not politically likely before we have got far more people cycling through the provision of attractive, continuous routes. It is also arguable that removal of gyratories is not necessarily desirable. In a transformed environment they could be useful in creating longer, less convenient journeys for cars than for bikes – acting as positive priority features, as they do in The Netherlands. The best possible result from a isolated junctions campaign is a few "spot improvements" on the road network that will not create the continuous, obviously safe and attractive routes we need to get a much bigger section of the population cycling. The roads leading to the junctions would still be horrible. Replacing existing gyratories with clogged-up crossroads, without providing dedicated space for cycling, would not be a breakthrough, and would not get many more people cycling. Quelle suprise. 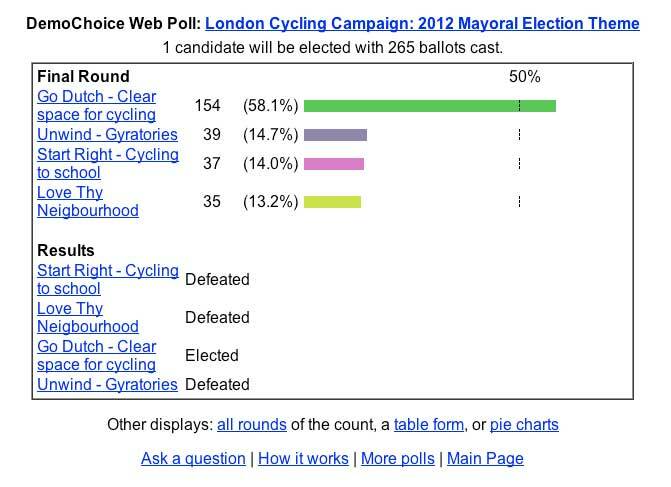 Paul Gannon wrote 11 years ago after Camden built its segregated cycle tracks that "Current cyclists vote with their wheels for segregated facilities". Well today they can vote with their mice as well, and the vole is pleased about that. Thanks for the plug. We've a bunch of people from the Cycling Embassy of Great Britain coming in September, and space for a few more. The language of the "Go Dutch" option is truly extraordinary. "Clear space" indeed. If they don't like the word "segregated", wouldn't "separate" have been a better choice ? Go Dutch is still in the lead by far, although the response is I think a bit disappointing (422 votes cast only). An additional stat (forgive me for I am a geek) is that Go Dutch is the first choice of 94.7% of voters. If that isn't an endorsement (1 pm 6 July) I don't know what is. What is interesting is that "going Dutch" would mean redesigning several gyratories and local areas anyway, thus leading to more kids cycling to school. Four for the price of one! I agree with both of you that the wording is awkward. Why "international standard" when there is no such thing, instead of "Dutch standard", which has the benefit of actually existing, together with detailed engineering specifications? "ensure there is clear space, Dutch style", in other words, segregation where appropriate. Or if the word reminds too many people of apartheid (the lone and sorry contribution of Dutch to the English language), separation as David mentioned. I voted for Gyratories 1, Go Dutch 2. The others strike me as only achieveable with a combination of these two. Why gyratories? Because they are very nasty and very dangerous not just to cyclists but to pedestrians and they sterilise the neighbourhoods around them. Picadilly/Pall Mall is one enormous gyratory and it will be improved by being restored to two-way. I admit that my cycling span is quite confined - western City, eastern Westminster, a bit of Camden and Lambeth/Southwark - but my sense from maps and from experiencing streets on the ground is that to make prohgress across the city is it rarely necessary to venture out of quiet streets and onto the larger, busier and more intimidating distrbutor roads. Or, to be more accurate, would be, if those streets were more permeable to cyclists. Westminster is particularly horrid, much worse than the City where some progress is now being made, with warrens of side streets through Covent Garden, Soho, Mayfair, and similarly north of Oxford Street, which are one way mini-gyratories with absolutely no (legal) cycle contraflows. Many of these streets could be opened up for two-way cycle traffic, and, dare I say, filtered permeability (chopped in two by bollards so only cycles can actually get from end to end). That would produce real results, until you collide with the inevitable gyratory, like trying to go east-west across the St Martins le Grand gyratory at Cheapside. As I've said before, I'm not sure the Piccadilly/Pall Mall scheme will be much of an improvement, with the loss of the bus lanes and transfer of cycle and bus space to cars that that implies. Paul M says "to make progress across the city is it rarely necessary to venture out of quiet streets and onto the larger, busier and more intimidating distrbutor roads. . Or, to be more accurate, would be, if those streets were more permeable to cyclists." This is, I would say, a central London thing. It is very untrue of of the outer suburbs, particularly Brent and Barnet, where there is in general no physical way to get from A to B without going on major and very unpleasant roads. This is because the outer suburbs were built after the railways were built, so the small number of crossing points that were there when the railways went in are still the only ones. The gaps between were infilled with new housing, so closing off the possibility of ever putting more crossings in. So the only possibility of a decent cycling environment in such places is good segregated tracks on the main roads. The Westminster thing with the "warrens of side streets" is mainly about parking. If they got rid of some of that they could fit in cycle contraflows, but keeping parking is their priority. In response to Nico, apartheid is an Afrikaans word, not Dutch (Afrikaans has also lent a number of other words to the English language - c/kommando, meerkat, springbok and trek). Sheridan, thank you for sharing your linguistic insights with us! It was a Dutch person who told me about apartheid being the only Dutch word etc, obviously I should have checked my sources more carefully. Am I right in thinking that the LCC has removed the link that previously allowed us to see what the current state of voting is? Are they that desperate to prevent us seeing how popular the "Going Dutch" option is?